Paeonia Old Faithful is the biggest red peony in existence. If you are looking a rough, tough and masculine peony, Old Faithful is what you’re looking for. Subtlety is nowhere to be found here. The broad buds, shaped like a rose, will transform to even broader flowers. Better clear some space! Because it is a spectacle to behold from start to finish. 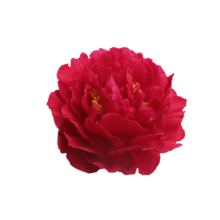 Old Faithful is a double-flowered red peony. Most noteworthy about this variety will be the extremely large flowers. Secondly, while the flowers are bright red already, they become even brighter as they open further. On top of that they spread a spicy fragrance letting you know that he is there. Old Faithful was bred in 1964 by Mrs. Elizabeth Falck. Glasscock and Falck registered her together under the same name. Due to the amazing characteristics of this peony variety, she was awarded with the APS Gold Medal by the American Peony Society in 1997. Old Faithful is a rugged, no-nonsense peony that works better on its own than part of a bouquet. In order for optimal vaselife you need to cut the stems diagonally and put it in lukewarm water. Also it would be great to add some flower food or sugar before enjoying these tough costumers.